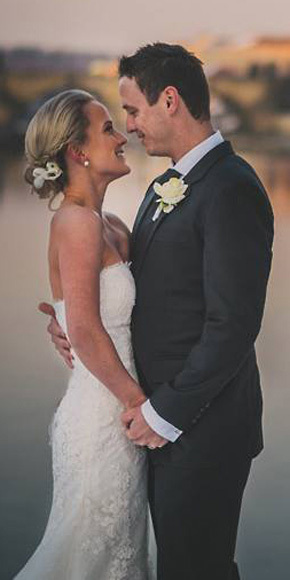 A perfect groom and a charming dress require beautiful makeup and hairstyle. I am sure you want to look wonderful during the wedding ceremony as well as in the photos and while having the toast in the evening. Thanks to my experience from dozens of weddings a year, I can lead you through the whole process of looking for the right makeup and hairstyle suitable for you, getting ready on your Day up to the moment when you say your ‘I do’. Weddings are matters of my soul, and being a perfectionist, I solely understand the bride’s wishes to have everything perfect on her big day. I will be happy to do makeup and hair for your bridesmaid, mom or other wedding guests. I can arrange an extra makeup assistant for the prep time. Should you wish to book your wedding date, do not hesitate to contact me providing the date, time and address where you will be getting ready. We will then schedule the wedding rehearsal two months before the actual wedding. I work mainly in Prague and surroundings; the transport within the city is always included in the price. The wedding day is so important and exceptional that the makeup and hairstyle must remain perfect the whole day, and the prep time must go like clockwork. For that reason, we always do makeup and hair trial prior to the wedding. Wedding prep without trial is, in my opinion, too risky and therefore I do not offer it to my clients. For wedding makeup, I use waterproof long lasting base fully covering any redness due to the rush of emotions. Wedding packages contain non-irritating Ardell false lashes providing natural looks and withstanding even some tears. I guarantee long lasting effects of applied makeup in the extreme temperatures of outdoor summer weddings. However, if you have very greasy skin or cannot avoid touching your face, or if you fear overwhelming tears of happiness, I suggest the wedding package including all day assistance. I will create hairstyle of your wish with a veil or fresh flowers. I use quality styling products and fixation techniques so that your hairstyle lasts until late at night. Hiring hair holders, accessories and natural hair clip-ins is included in the price of wedding packages. Eyebrows underline your features and facial expression, and their shape and colour is therefore essential on your wedding day. I will professionally trim and tint your eyebrows to the desired shape matching your face type. If your eyebrows are over plucked or they lack the volume, I offer 6D eyebrow repair and thickening. By adding individual hair, I will thicken your eyebrows and add hair where necessary. Everyone will want to see your wedding ring, your hands, therefore, will become the centre of attention. If you do not have a good manicurist, I suggest CND Shellac nail polish in wedding white, gentle natural and rouge shades lasting perfectly throughout the whole wedding and your honeymoon. I can mix a particular colour shade of your wish. Although I hadn’t expect it, a sudden anxiety overwhelmed me on my wedding day. Ariana calmed me down by being there for me; she applied an anti-stress roll-on on my wrist to inhale and provided me with professional advice. Beautiful makeup and hairstyle in the photos still make me happy, but her help saved my Day. The amount of compliments I got on my wedding day I haven’t heard in my entire life. After the wedding, my sister and I took Ariana’s makeup course. Those 20 minutes in the morning are worth it and I keep getting number of compliments! I wasn’t sure about the base I should have for my wedding makeup. During the makeup rehearsal, Ariana applied a thin base layer on one cheek and a thick one on the other so that I could make my choice. When my beautician over plucked my eyebrows five days before the wedding, I got furious. But Ariana managed to repair it with false hair so that nobody noticed.